Says ESPN, regarding Hank's analogizin' the other day on Fox and Friends: "We have decided to part ways with Hank Williams, Jr. We appreciate his contributions over the past years. 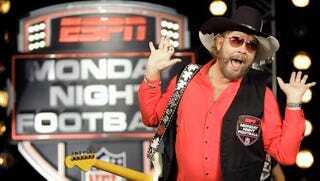 The success of Monday Night Football has always been about the games and that will continue." Freedom of Speech, so therefore Me, My Song, and All My Rowdy Friends are OUT OF HERE. It's been a great run."